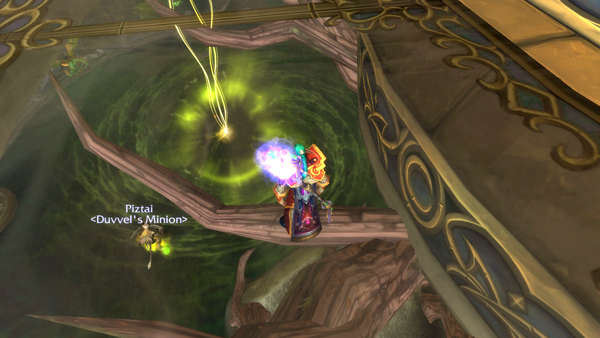 After defeating Murozond in the End Time instance Nozdormu is able to port you back in time to the Well of Eternity. Your mission is to recover the Dragon Soul before it is destroyed so that we can use it in the present time to defeat Deathwing. Upon entering the instance you’ll pick up quests and while doing that you’ll see that there are about a bazillion Burning Legion demons on the march. You’ll also notice that you’re a Night Elf. 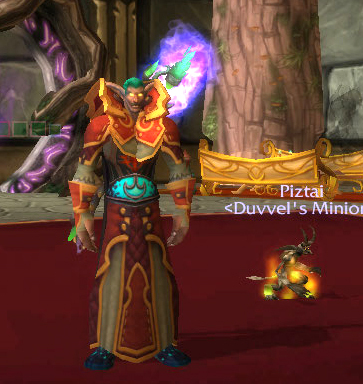 Our task is to shut down that portal that the Burning Legion is using. 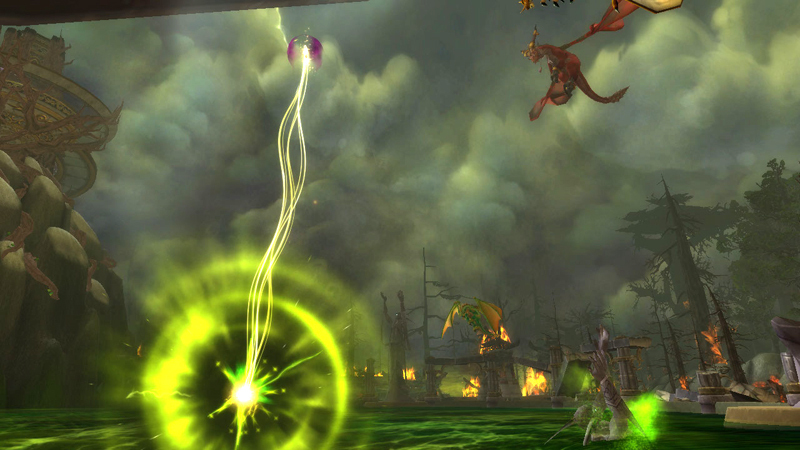 Illidan Stormrage casts a stealth spell on the group and leads you to the crystals that need to be destroyed. It’s a good idea to put a raid marker on Illidan because it’s hard to follow him when he’s stealthed. Kill the mobs guarding the crystals and move on to the next. When all of the crystals are down the first boss appears. Peroth’arn seemed pretty easy. 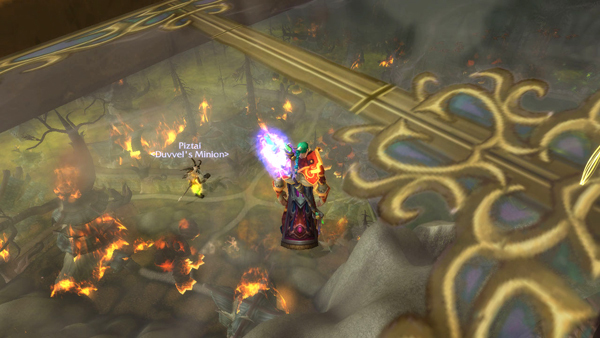 From a ranged DPS point of view I just had to burn him down and stay out of the fire. Next we head into Queen Azshara’s palace killing trash up the ramp, which is transparent so you can see all of the battle raging below, and to Azshara’s platform. She brings adds in a couple at a time. You have to kill them all before she will join in the fight. Use CC if the adds get to be too much. Azshara does an interesting attack that turns you into puppets. Interrupt this or you’ll probably all die (like we did). Azshara gives us a lesson in puppetry! Once Aszhara is saved by her lackey (You don’t actually kill her). The bronze dragon-flight arrives to take us to get the Dragon Soul which is floating above the Well of eternity. The Well of Eternity has seen better days! As soon as we get there we are joined by Alexstrazsa and Ysera and eventually Deathwing shows up and gets all possessive about the Dragon Soul. The Aspects decide that the Dragon Soul is being protected by the old gods and we need to do something else to get to it. Our dragon mounts take us to meet the last boss. 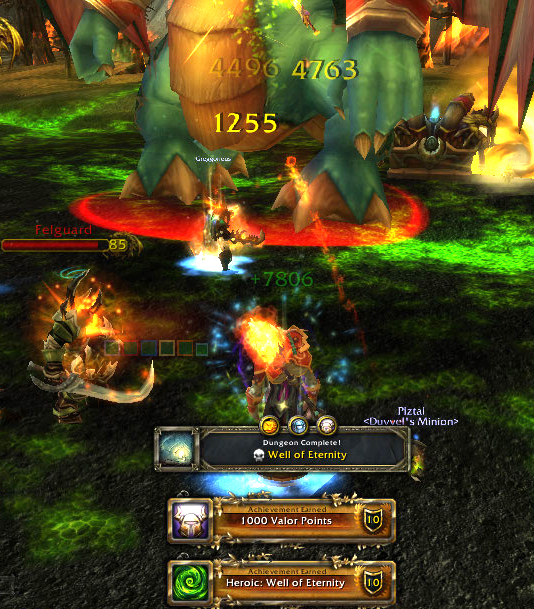 Mannoroth is protected by Varo’then and demons are streaming in all over the place. Illidan tells us to take care of Varo’then while he handles Mannoroth. Tyrande handles the demons, although from time to time she will become overwhelmed and need help. If she cant keep them under control they WILL swarm your healer. Most of the time you will concentrate on Varo’then until he’s dead. When Varo’then dies he drops his sword. Throwing the sword at Mannoroth weakens the demon’s armor enabling us to damage him. So make sure that you throw the sword at him. Once Mannoroth is defeated (you don’t kill him either) there is some cool RP that lore lovers will want to witness. Mannoroth is a big dude!